If you're looking for an outstanding value in furnaces, look no further than the latest generation Goodman GDS series 80% efficient furnace. 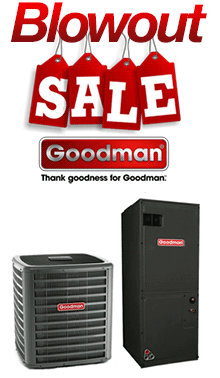 Goodman packs all the latest high-technology features into this furnace - Features like the energy-saving, reliable hot surface ignition system with patented adaptive learning algorithm to maximize the igniter life and the corrosion-resistant, aluminized steel tubular heat exchanger for many years of trouble-free service. The GDS8 furnace is easily converted for use with propane with the addition of the field installed LPT-00A propane conversion kit for only $32.00. The energy-saving PSC, multi-speed, direct drive blower motor is among the quietest and most dependable available. This furnace will arrive at your home completely assembled and factory run-tested to ensure that your installation goes off without a hitch. The furnace can be installed in a downflow (ductwork above under the furnace) position without the need for modification or horizontally ( furnace in an attic or crawlspace) without the need for modification. Your installer will appreciate the thoughtful installation flexibility provided by the rotating combustion air blower for venting through the top, right-hand or left-hand side The convenient left or right connection for gas and electric service will make installation a snap. The GDS8 series furnace can be installed almost anywhere in your home, including the attic, crawlspace, garage, closet, or alcove. The return air can be ducted through either side or from the bottom, depending on your particular need. If your replacing a similar furnace with this Goodman GDS8 series furnace it will normally require about 4-6 hours to complete the job. Goodman has thought of just about everything to make installation quick and easy. Finally the GDS8 furnace features a heavy-gauge, reinforced and insulated steel cabinet with a durable and attractive baked-enamel finish. You and your family can rest easy knowing that Goodman provides a generous foil-faced insulation in the heat exchanger compartment for maximum sound reduction. The furnace can be installed in a downflow (ductwork above under the furnace) position without the need for modification or horizontally ( furnace in an attic or crawlspace) without the need for modification. Your installer will appreciate the thoughtful installation flexibility provided by the rotating combustion air blower for venting through the top, right-hand or left-hand side The convenient left or right connection for gas and electric service will make installation a snap.